under decompression air-flow type ultra-fine micronizer "CEREN MILLER DAU"
Not only miniaturize the machine, but also sanitary bag filer is built in. Disassembling, assembling, cleaning of filter are easy. It ensures complete sanitary. What is continuous batch method trituraton under decompression? 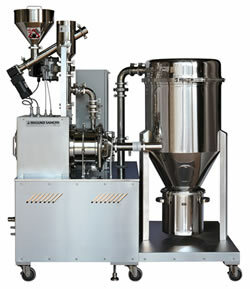 This is continuous batch method trituration machine under decompression by adjusting material feeding volume. Characteristic of batch method is "ultra atomization by triturating repeatedly" and "preventing deterioration by decompression trituration" (adiabatic expansion effect works temperature drops). It makes finer particles with less discoloration, less alteration, and less deterioration of taste. Inert gas can be fed under decompression, and it grows material protection effect more effectively.